Primary schools in regional China with large ethnic minority populations are confronting the challenges of policies concerning multilingual education, comprising the minority language, Mandarin Chinese, and a foreign language, usually English from Year 3 (Adamson & Yi, China’s English: A history of English in Chinese education, Hong Kong, Hong Kong University Press, 2015). English, which is selected for its significance as an international language, is different from both Chinese and Mongolian in its writing system as well as its linguistic features. This chapter analyses the role and nature of English in the curriculum of a Mongolian minority primary school in the Inner Mongolia Autonomous Region (IMAR). It focuses on three aspects: policy decisions at the state and provincial levels, the views and arrangements of the school leaders, and the pedagogical decisions made by teachers in the classroom, with a particular focus on the medium of instruction. In addition, the relationship between English and the other two languages is discussed in terms of models of trilingual education. National Bureau of Statistics of China (2011). Tabulation on the 2010 population census of the People’s Republic of China. http://www.stats.gov.cn/english/statisticaldata/censusdata/rkpc2010/indexce.htm. Osnos, E. (2008, April 28). Crazy English: The national scramble to learn a new language before the Olympics. New Yorker. http://www.newyorker.com/reporting/2008/04/28/080428fa_fact_osnos?currentPage=all. Qi, Y. G. (2016). The importance of English in primary school education in China: Perceptions of students. 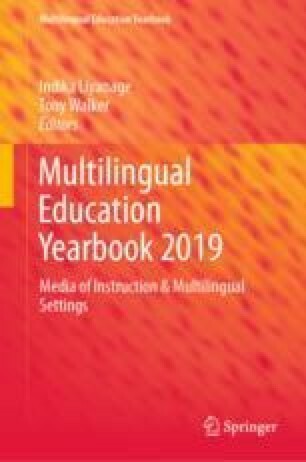 Multilingual Education 6(1. https://doi.org/10.1186/s13616-016-0026-0.